The hearing property of human ear is limited. Human ear can perceive the sound in a frequency ranging between 20 Hz to 20 kHz. The sound frequency below 20 Hz is Infrasonic and above 20 kHz is Ultrasonic sound. Human ear is not sensitive to Ultrasound because the eardrum cannot vibrate as fast as ultrasound. Ultrasound can easily pass through solids. Ultrasound has high frequency so the wave is very powerful. Ultrasound travel along straight even in the presence of obstacles. When the ultrasound hits an object, it bends and round and spread in all directions. Even though human ear cannot sense ultrasound, many animals can produce and hear ultrasound. Many insects, rodents, bats and small mammals communicate through ultrasound. Insects have sensory structures to produce and detect ultrasound. Cockroaches have “Sensory hairs” which are sensitive to ultrasound. Spiders, Wasps, Beetles, Flies etc have a “Tympanic membrane” to detect ultrasound. Fleas communicate using high frequency ultrasound. Mosquitoes produce ultrasound for communication. They have sensory structures to receive ultrasound. Spiders, lizards also have ability to sense ultrasound. How the Ultrasound repel pests? The Ultrasound sensors are present in the antennae of Mosquitoes and genetalia of Cockroaches. Ultrasound emitted by the repeller will scare away the pests and confuse them. The ultrasonic pest chaser emits high frequency ultrasound waves between 32 and 40 kHz to create an acoustically unfavorable environment that repels mosquitoes and other pests. Ultrasonic sound will create stress on the nervous system of insects like mosquitoes and jam their own ultrasound frequency. This will immobilize the mosquitoes and they escape from the source of ultrasound. 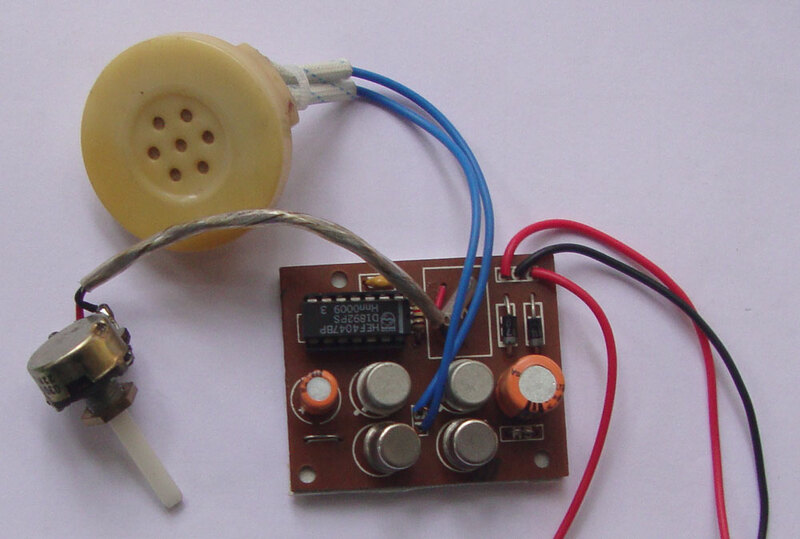 Ultrasound Mosquito Chaser emits powerful ultrasound vibrations using an Astable multivibrator. The external capacitor and resistor are so selected to give an output frequency with in the range of 300 Hz and 40 kHz. The frequency can be adjusted by using a Preset (VR). Power the circuit and adjust the wiper of Preset in the middle position, so that a strong whistle sound will be heard. Then adjust the wiper towards one end, sound will decrease and enters into the Ultrasound frequency. Keep the wiper in this position so that the output frequency will be 36-38 kHz. The output from the IC is further amplified by a complimentary power transistor combination. The amplified output pulses are emitted through a piezoceramic tweeter with metal diaphragm. The output power of the unit is 2 watts, 1.3 dB. This can cover up to 500 meters in a straight path with out any obstacles. In practice, the ultrasound waves from the unit will cover 1000 square feets if the unit is placed in an open place. 1. Ultrasound is biologically safe to human beings as per scientific information. But ultrasound frequency close to 30 kHz can be sensed by children to a certain level. So it is recommended not to use the unit near the children below 5 years continuously. 2. It is not necessary to use the unit continuously. Mosquitoes become active around 6 pm. Switch on the unit around 6 pm and keep the doors and windows open for two hours. Those mosquitoes that are trying to enter the room will be repelled out. Switch off the unit and close the windows and door. Switch on the unit at night if required. 3. If the unit is switched on continuously outside the house mosquitoes can be scare away from the premises of the home. 4. Preset provided in the circuit is for adjusting the frequency of ultrasound. Preset is adjusted to give ultrasound in the frequency 36 kHz. So the unit will be silent even though it is emitting powerful sound waves.